Multiple language operation manual (Japanese, English, German, French, Spanish, Chinese, and Korean) available. Please specify the desired language when ordering. Detailed code model available to customize specifications best suited to you. The control mode allows easily configuring settings and making changes with parameters. For the correspondence between the above control mode and control types for each model, please refer to the specifications of each model. With built-in ladder sequence control, the range of applications are dramatically increased. This feature is standard in all the UTAdvanced controllers (except UM33A). 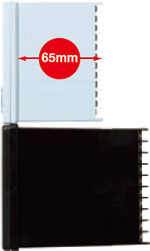 The ladder sequence control function can replace a small PLC required by the application. 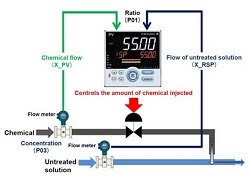 Sequence control and PID control can be performed simultaneously. Solve digital input/output logic functionality easily. The ladder sequence program is built in the UTAdvanced as standard. The ladder sequence function enables monitoring and controlling peripheral devices such as relays, thus making it possible to reduce costs. Alarm action was built by a sequence control circuit (relay, timer, etc.) outside of the controller. Alarm action is built by the ladder sequence program inside the UTAdvanced, thus making it possible to reduce costs. Various types of analog data were captured into the host system (PLC, etc.) and calculated, and the results were processed by the field controller for control via a command. The UTAdvanced with up to 4 analog inputs* enables various types of analog data to be captured directly into the controller and calculated by the ladder program, thus reducing the system-building load of the host. Action: Various types of analog data were captured into the host system (PLC, etc.) and calculated, and the results were processed by the field controller for control via a command. Select from TC, RTD, mV/DC voltage and DC current. The input type and range is user selectable via the front panel or by using the LL50A parameter setting software. Connect up to two 2-wire transmitters simultaneously. All instruments have a 15 V Loop Power Supply (15 V LPS) for a transmitter. In addition, a 24 V LPS is also available simultaneously for some instruments as optional function. User selectable for relay, Voltage pulse and current outputs. Heating/cooling control has two sets of universal outputs. 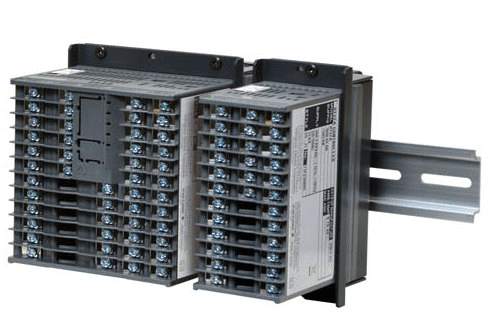 Any combinations of relay, pulse and current outputs are available. Drive a motorized control valve by using position-proportional PID. The position-proportional PID control function has two sets of relay outputs for direct/reverse rotation of motorized control valve. The slide wire input to feed back the valve position is also available. The following conditions can be set in order to increase the accuracy of calculating PID constants using AT . Two types of algorithms to calculate PID constants are available for selection. High and low output limits can be set individually for control output values during AT runtime. The field proven SUPER function utilizes a built-in operator experience and fuzzy theory to deliver fine control and suppress overshoot. The new SUPER2 function utilizes a built-in operator experience and modern control theory to deliver fine control and suppress hunting. Parameters that determine controller functions can easily be set: controller model type, controller mode (single-loop control, cascade control, loop control with PV switching, etc. ), universal input/output functions, setup parameters and others. It also allows you to create program patterns. Used to tune a controller's PID parameters. 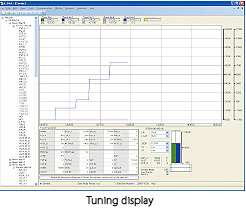 Displays measured input value, target setpoint, and control output value as a trend graph on a personal computer screen, allowing PID parameter modification, AUTO/MAN switching, control output modification in manual operation, etc. Ladder sequence programs can be created and ladder programs can be monitored. Can be used to create an electronic device data sheet for Open Network. Can be set parameters and ladder program while no power supply to controller. Can be used while attached to the control panel. * The same operation displays as those of the UT are also available. Use this function when checking the program pattern setting. Only times of segments and time events can be faster. The controller can serve as a program pattern generator. If the progress of the operation of one unit is faster, the program operation can be forcibly stopped by digital input when switching between segments. Thus, synchronized program operation can be performed. The controller menus and layout are adjusted in accordance with the level (EASY, STD, PRO) of information required by the user. If simple temperature or level control is needed, then select the easy configuration. Very sophisticated applications are no problem for the UTAdvanced. Just select the PRO setting and make use of the additional functionality shown in this mode. Advanced applications can be programmed in the PRO setting and then changed back to the easy setting to lock out functions not required by operators. 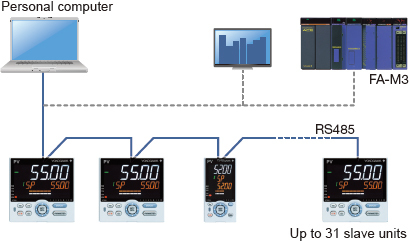 With Yokogawa's Active color display you can instantly tell, at a glance, the status of your process. Alarm Status: Active color display changes from white (normal) to red (alarm). Deviation Status: Color changes based on a PV deviation from SP. User-defined Color: Choose between white or red display for constant Readings. The 65-mm depth of the controller reduces the constraints on installation location. The navigation keys is an intuitive method to navigate the controller's configuration menus and setting its various menus. Navigation arrows even tell you what button to push next. It is easy to assign frequently used functions, such as the operation mode switch, Run/Stop, program pattern selection, Remote/Local, alarm latch release, and PID parameter display. The function of an external switch can also be assigned to the front panel key in conjunction with a ladder sequence program. 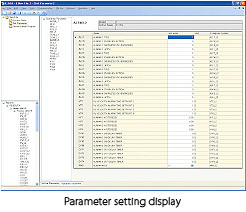 The UTAdvanced is equipped with a scrolling text feature that fully lists the parameter being modified. There is no guessing what parameter you are looking at. It is possible to turn off scrolling the text function. The UTAdvanced is fluent in multiple languages — English, Spanish, French, and German. The use of the UTAdvanced by local language operators is not an obstacle. Parameter values (SP, P, I, D, ALM1, etc.) configured by the user can be stored in the controller as the default values. Even if a parameter set value is accidentally changed, it can be restored to the original value with a simple operation. Now you can choose a color that matches your work area: white (light gray), or black (light charcoal gray). 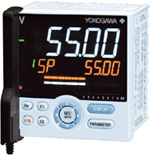 LL50A Parameter Setting Software (sold separately) allows for easily setting parameters. 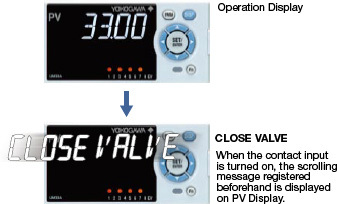 Using the message function and turning the contact input on/off, the message registered beforehand can be displayed on PV display by interrupt.The message is registered using LL50A Parameter Setting Software.The messages are limited to 20 alphanumeric characters. A maximum of four messages can be registered. Minimum parameters necessary for operation can be set. The password function can prevent inadvertent changes to the parameter settings. If a password is set, the password is required when moving to the Setup Parameter Setting Display. When the password is verified, can be changed to the Setup Parameter Setting Display. A simple and easy network connection is provided! A built-in function in the controller eliminates the need for a converter and makes wiring simple. Modbus TCP/IP, a protocol that allows the controller to connect to any Ethernet network and have the ability to exchange data with the computers or devices on that network. Allows control devices to be integrated into an application simply. Works with any Modbus TCP/IP compliant software. Support for Modbus function codes 03, 06, 08 & 16. 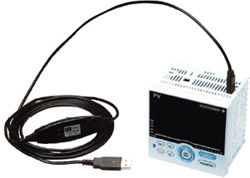 Gateway function allows RS-485 Modbus devices to communicate via Ethernet. Reduced labor costs in wiring and setup of a communications network. Embedded open networks will provide direct connection to PLC's. The use of the ladder sequence program makes it possible to exchange analog data and status data between communication-capable UTAdvanced. Example: A UTAdvanced in which an input error occurs sends a signal to another UTAdvanced to enable that UTAdvanced switch to MAN operation, thus shifting the whole system into a safe mode. In such a case, the safety mechanism can be built into the UTAdvanced and is not required in the host system. In coordinated operation, a single UTAdvanced termperature controller is used as a master controller and multiple UTAdvanced or other UTAdvanced digital indicating controllers as slave controllers. The slave controllers are operated in accordance with the actions of the master controller. A protocol used for communicating with a general-purpose personal computer, or UTAdvanced series link module and serial communication module of FA-M3R (range-free controller). 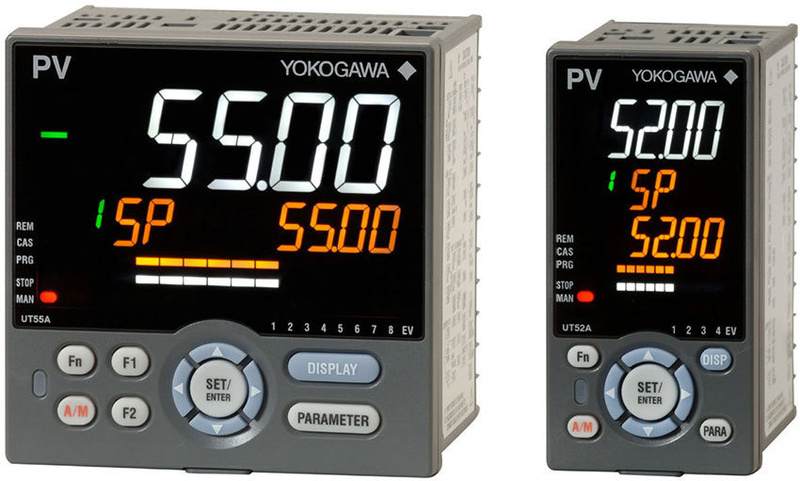 Backed by the high reliability and quality that Yokogawa has cultivated over many years. UTAdvanced is environmentally safe when disposing. UTAdvanced can also be used for food-processing equipment with washable control panels. The 3 year warranty extends 36 months after shipment from our factory. The table above includes specifications of the standard models only. * 1: Hose down test only. UTAdvanced series Parameter map list for each model can be downloaded. Please use it to manage and save the set parameters. Also please use it as a reference for the key operation at that time. Mercian uses the Part 11-compliant DX200P Paperless Recorder in its pharmaceutical manufacturing works. The Japan Steel Works, LTD., Muroran Plant uses the Control and Measurement Station CX2000, UP series program controllers, and UT series digital indicating controllers for operation of its heat treating furnaces. The Japan Steel Works (JSW), LTD., Muroran Plant is located in an industrial area looking over Muroran port in Muroran City, Hokkaido. Kyushu Mitsui Aluminium uses the UPM100 Power Monitor for its overall factory operations, and the DX1000 Paperless Recorder for its high-purity aluminum refining furnaces. The UT55A can come with up to 8 alarm outputs that can control the fans. Ladder sequencing is build in, allowing you to use a timer or other such function to set up a time delay on each output. 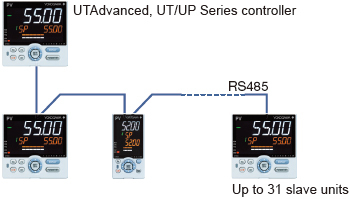 The UTAdvanced Digital Indicating Controller comes standard with ladder sequence programming. The ladder sequence function can handle measured and computed values from the controller. Using this function, the UTAdvanced converts outputs from other controllers such as YS15001 to time proporioning outputs. UTAdvanced Digital Indicating Controllers come standard with ladder sequence functions in ladder programs, some of which can process data (measured and computed values). This is an example of applying those ladder programs to create a ratio station. The DAQWORX Data Acquisition Software Suite is used in the evaluation and testing of industrial packaged air conditioners for remote operation of the temperature and humidity controller, and for multi-logging of temperature and humidity data from separate test floors. Load devices are sometimes used when evaluating (measuring) DUT performance. Depending on the parameter being evaluated, multiple controllers can be employed to control the performance of the load device, but there are also times when the load device uses only one actuator. 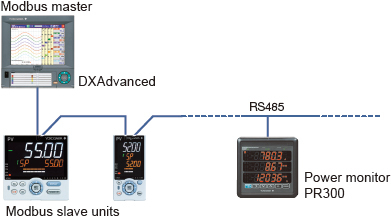 The UTAdvanced Digital Indicating Controller comes standard with a ladder sequence program. By using the Ladder Sequence function, you can eliminate relays and other peripherals to cut down on costs. 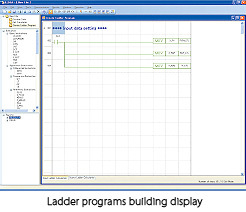 The UTAdvanced ladder function can be used to run programs. You can also incorporate the "guarantee soak" that is required for quenching and other processes on metal parts. 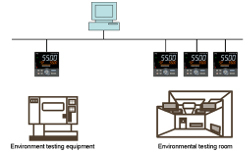 Environmental testing equipment (rooms) is key to checking ambient temperature and humidity in environmental worthiness tests for a variety of products (refrigerators, air conditioners, automobiles, etc. ), and controllers for such equipment are also widely used. UTAdvanced; how do I prevent the controller from entering Quick Start Mode every time it powers up?